Planning for the new MUHC clinical laboratories at the Glen has been years in the making but more recently, the Optilab project, a reorganization of the province’s lab services, added another dimension to the planning process. The MUHC was designated as a “centre serveur” by Optilab, making it one of three supra-regional laboratories which are the largest facilities in the province. The role of the "centre serveur" is to continue to serve its own patient population as well as provide lab testing for other institutions according to its expertise or geographical location. “For the most part, the MUHC labs will continue to do all forms of testing for MUHC patients but we are now analyzing all non-urgent tests from many other hospitals as well,” says Ms. Gravel. 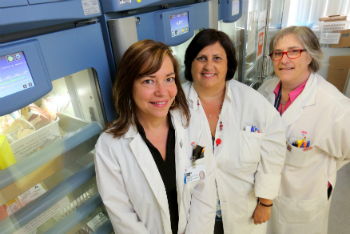 The Clinical Labs department was one of six Major Optimization Projects (GPO) launched at the MUHC last year. Workgroups within the department looked at issues of centralization, and how best to standardize and optimize their practices. By the end of 2013-2014, the department realized savings of more than $2 million, while maintaining their annual volume. The Clinical Labs are currently spread out over the MUHC’s various sites but the move to the Glen will bring lab services altogether under one roof where everyone will work in larger teams in a bigger, more open facility. All labs at the new MUHC will be located on levels 4 and 5 of Block E, which is also home to the Research Institute. The facilities will include the Central Lab, which includes biochemistry, and hematology. There will also be the cytogenetics, genetics, cytology, pathology, and microbiology labs, and a molecular diagnostic laboratory. The lab staff at the Children’s numbers around 100 people, and they are part of an MUHC-wide team of nearly 700. Transfers and training are already taking place in some areas. For example, there are Montreal Children’s Hospital (MCH) staff who recently transferred to the Royal Victoria Hospital (RVH) labs to work with their RVH colleagues on both pediatric and adult samples. “We won’t have separate adult and pediatric work stations in the future, so this is excellent training for what’s ahead when we move,” says Ms. Gravel. At the new hospital, walking the distance from Block A or B over to Block E will take several minutes. Blood tests, however, will make the trip in seconds thanks to the pneumatic tube system. “The advantages are tremendous,” says Ms. Gravel. “There is never any need to wait. Once a blood test is done, staff can send the sample via pneumatic tube and it will arrive in the labs in seconds.” There is also a priority system to allow urgent requests to get through first. In these cases, the turnaround time will be less than one hour, with results posted immediately to OACIS. Certain staff members from each site have been designated as early activators and are involved in testing new work flows; some are receiving training on new equipment and preparing the new work areas at the Glen. There will also be “super-users” on certain equipment; they will eventually train other staff on the equipment as well. While some of the equipment currently used at each of the MUHC sites will be transferred to the Glen, one new piece of equipment being installed at the Glen—a four-track automated system which links four different areas of activity (biochemistry, immunochemistry, coagulation and hematology)—will be the only one of its kind in North America. The super-users will be the first to receive training on the new automated system, which will take place before the move in April 2015. The first group of clinical lab staff will move in April when the RVH moves. Most staff from the MCH will move in May. “The Clinical Laboratories management will ensure that the Children’s has the required number of lab staff to cover all patient needs right up until the final day of the move,” says Ms. Gravel. Certain staff from the Montreal General Hospital and Lachine Hospital will also move to the Glen, but both sites will maintain stat labs to offer the services required to patients.